Charles Lane of the WaPo has shown occasional good sense, usually accompanied by poor political judgement. A year ago he thought the arguments against the Keystone Pipeline were ludicrous. But then he showed his misunderstanding of politics by predicting that Obama would eventually see the light. Right, but wrong. He seems reasonable, which is unusual on the liberal side these days. So I pay attention to what he says. He’s out today with a column predicting a big Cruz loss to Clinton. He just won’t lose as badly as Trump. He bases this on some Gallup polling which shows the voters are less receptive to the Reagan message today than they were in 1980. And since the Cruz and Reagan messages are more or less the same, Cruz can’t duplicate Reagan’s victory. He points out that the general election polls show Clinton with a small lead over Cruz. He fails to mention that in March of 1980 Carter led Reagan 58-35. In April, with the candidacy of John Anderson, Reagan’s support actually declined to 32%, with Carter at 40 and Anderson at 21. So much for polling this far out. Clinton is a far weaker candidate than Carter was. He was honest, but incompetent. Clinton is thoroughly corrupt, and more incompetent by far. Most people kind of liked Carter, and thought he tried to do the right thing. Clinton is disliked, distrusted, and, at the least, will come perilously close to being indicted for God knows what. There’s always the D word, of course, — dreaded demographics. But in 1980 the Democrats could still claim to be the champion of working class whites. Now they seem to go out of their way to alienate them. And what, precisely, is the theme of the Clinton campaign? Competence? Experience? Stay the course? Happy days are here again? No, it’s higher taxes and more government. More immigration, more Middle East refugees, more kowtowing to any zany left wing idea Socialist Bernie can come up with. What will Clinton do differently, or better, than Obama? Aside from her gender, and her worthless husband, what is it about her that turns on the voters? She’s old and tired and cranky. She’s shrill and reeks of entitlement. She’s just the worst Presidential nominee in my lifetime. But Cruz is an extremist, and wants to do radical things like abolish the Dept. of Education. Well, I suppose the teacher’s unions are aghast, but what have we got to show for almost 40 years of this political payoff to the NEA? Nothing. Our system of education has declined ever since this Department was created. Let Clinton try to make the election a referendum on the virtues of keeping the federal behemoth intact. Cruz will campaign on the economy, jobs, opportunity, and personal liberty. He’s got a great case to make, and is an effective communicator, and getting better. He’s learning as he goes along. That’s what smart people do. 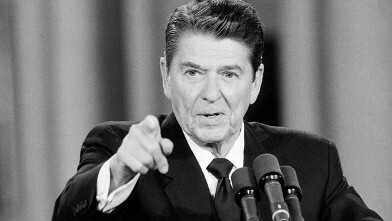 In 1980 Reagan had the Cold War to win, and was elected, in part, to accomplish just that. Cruz has ISIS and Al Qaeda to destroy, and he will campaign as the man who will do the job. Clinton’s record in foreign policy is an unmitigated disaster. The Libyan debacle, and the Benghazi farce, are on her plate. One Big Thing that Lane doesn’t see is that the utter failure of Obamacare marked a turning point in our politics. No Democrat can come forward with a proposal for some massive federal program to solve some pressing national problem. It won’t fly, politically. after the lies they told, and the mess they made. All they can do is promise to make the federal government more efficient, do a better job. It’s a status quo, even a reactionary, agenda. Once Cruz has dispatched the Moron he’ll unite the rest of the party behind him. If nothing else, the fear we feel for our country, if Clinton is elected, will motivate Republicans to back him. Some of Trump’s people will walk away, it’s true. But what about Bernie’s people? Are they all going to get on the Clinton bandwagon? But the biggest thing that Lane misses is the general attitude of the American people toward the federal government. Most of us feel the same way toward it as we do to Clinton — dislike and distrust. The Democrats are the party of government. 2016 will be a Cruz landslide. If Charles Lane wants to make a bet on that, I’ll oblige him.